What Are Normal Temperature and High Temperature? A fever, or commonly referred to as a high temperature, is not an illness, but a symptom that points to an underlying condition. Usually, it is caused by an infection. Some experts are of the view that fever is in fact your body's natural defense against infections. Whether or not you require a treatment for high temperature usually depends on your physical condition, age and the underlying cause of fever. You should, however, take things more seriously if you notice high fever in kids. The normal body temperature is somewhere between 96.8F (36C) and 98.6F (37C), which means you have fever when your body temperature is higher than 99.5F (37.5C). It is obvious to feel scared when you kids have fever. However, don't blame yourself. You should understand that every child would eventually experience a fever even if you try your best to protect him/her. It is usually not dangerous and quite often goes away in 2-3 days. Your kids will experience fever due to different reasons, and you don't always have to worry a lot about it. However, there are certain situations when you cannot relax and have to consult your doctor about the condition of your child. Keep reading to know when to relax and when to see a doctor. It is important to understand that your body temperature keeps changing throughout the day. Also, the normal temperature range may also vary depending on activity level, age and other factors. You don't have to worry usually when it's below 100.4F. Moreover, you don't have to worry when your child's behaving fine and is eating/drinking normally. For children between 3 months and 3 years of age, the temperature up to 102.5F is considered normal. You also don't need to worry about the fever your child experiences after being immunized – this usually lasts less than 24 hours. You should worry a bit if your child is younger than 3 months and have developed a fever – this could be due to a serious illness. You need to see your doctor if your child's fever is higher than 104 F and isn’t improving in 4-5 days. If your child isn't behaving normal and is not taking enough liquids, this should concern you a lot. Again, you need to consult the doctor if you've immunized your kid but the temperature isn't going away even after 24 hours. If you find the kid's temperature is a little high, the most important thing at first is to keep an eye on his or her temperature. You should buy a thermometer if you don't already have one at home. It is important you select a right thermometer because there are different types of them available in the market today. You can find mercury, glass, digital and tympanic thermometers. It is a good idea to avoid tympanic thermometer because you may not be able to use it properly and get incorrect readings. Glass thermometer is a good choice, but you have to take proper care of it because it breaks easily. The best choice is a digital thermometer that doesn't cost you a lot but takes correct readings in seconds. The following video will explain more about using your thermometer. You may want to give your child ibuprofen or acetaminophen if he/she is feeling uncomfortable. Don't give aspirin to your child without consulting your doctor. Avoid giving any medication if your infant is younger than 2 months. Similarly, it is a good idea to discuss what medicine your child can take if he/she has any medical problem. Consider dressing your child in breathable, lightweight clothing. Overdressing will keep body heat from escaping, which in turn will increase the temperature. 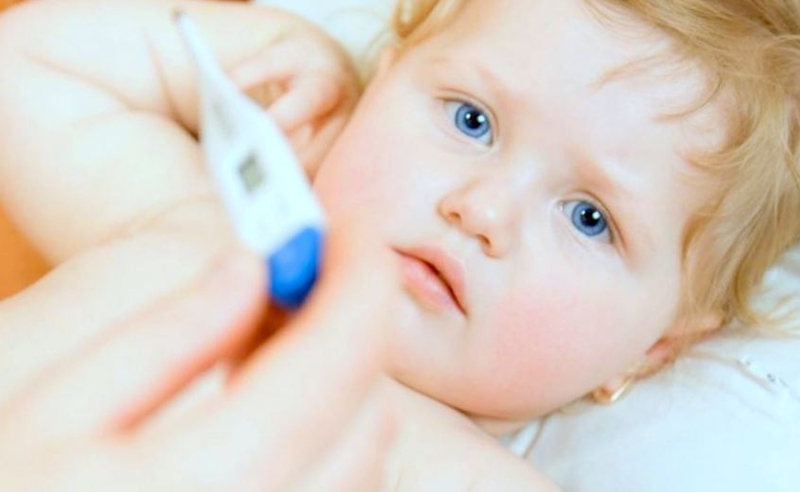 Be sure to maintain a good temperature in your kid's room when you're dealing with fever in children. Make sure to keep your child hydrated while he/she is dealing with high temperature. Fever will always make your kid lose fluid quickly, so it makes sense to give him/her fluids, such as soup, water, flavored gelatin and ice pops. Don't opt for drinks that contain caffeine, such as tea and colas because they will encourage urination and make dehydration more of an issue. Your child may have high temperature with other symptoms such as diarrhea and vomiting. It is a good idea to consult your doctor and see if you can give him/her an electrolyte solution. Several types of rehydration solutions are available in supermarkets and drugstores. You can buy one with ease. Just be sure to avoid giving sports drinks to your child because the added sugar may make things worse. You should allow your child to eat what he/she wants, but give it in reasonable amounts. Also, make sure that they take plenty of rest – you may even consider keeping them home from school until the temperature gets back to normal and stays there for 24 hours. You may think of giving your child a lukewarm sponge bath, but there's no medical evidence that this will work. In fact, this may even make your child uncomfortable. Similarly, you should avoid ice packs baths and never use alcohol for sponge baths.